On November 29, 1967 Promoter Ed Francis presented a wrestling card at the Honolulu International Center that featured three tag team matches and two individual matches. 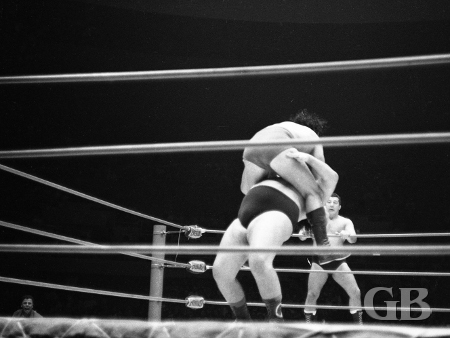 In the individual matches, Ripper Collins took a one fall verdict from The Alaskan and Kenji Shibuya defeated Beauregarde. In the first tag team match of the evening, Billy White Wolf and Nick Bockwinkel won by disqualification over the team of Ray Stevens and Pat Patterson. Nick Bockwinkel dropkicks Ray Stevens. 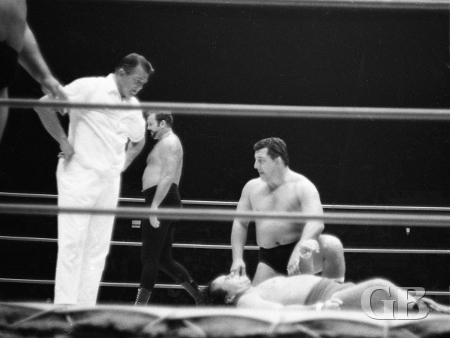 Bockwinkel applies the abdominal stretch on Patterson while White Wolf looks on. The second tag team match featured Sailor Art Thomas, who was making his Honolulu debut. He teamed with Bearcat Wright to do battle against the team of Killer Kowalski and Angelo Poffo. After each team gained a fall, time ran out and the match was declared a draw. Bearcat Wright kicks Killer Kowalski. 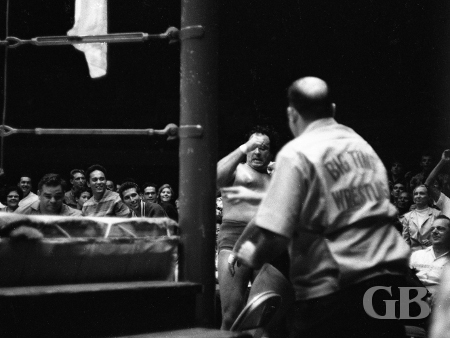 Art Thomas is worked over in the corner by Kowalski and Poffo. 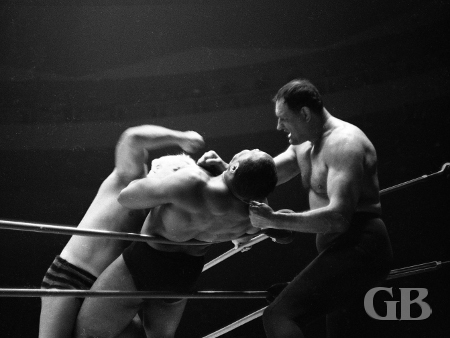 Killer Kowalski applies the Full Nelson on Bearcat Wright. The main event was a rematch for the Hawaiian tag team championship. Curtis Iaukea and Dutch Schultz the champions putting their titles on the line against former champions Jim Hady and Johnny Barend. One stipulation in the match stated that if Barend and Hady won their titles back, Barend would get a shot at Iaukea's United States title on the next Honolulu International Center card. After the two teams split falls, Hady pinned Schultz for the third and deciding fall to become the tag team champions and thus allowing Barend to get a shot at Iaukea's United States title. Art Thomas lifts Killer Kowalski off his feet. 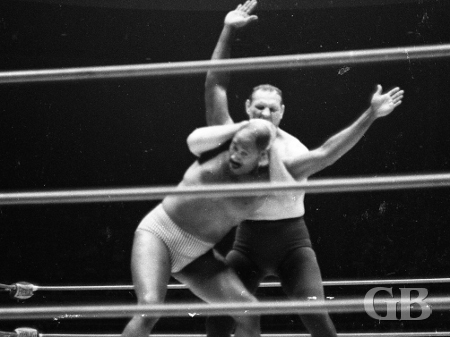 Curtis Iaukea chokes Johnny Barend as Dutch Schultz attacks from behind. 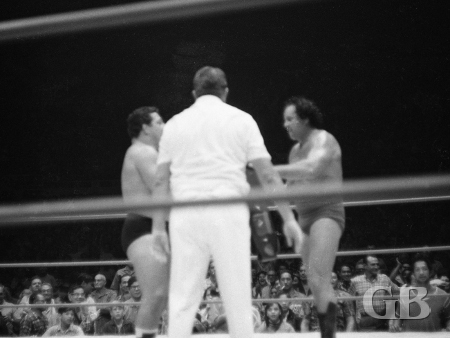 Jim Hady winds up to deliver a smash to Curtis Iaukea as Barend watches from the corner. Hady kneels over Barend after losing the second fall. Referee Pete Peterson looks on. A dazed Johnny Barend staggers around outside the ring. 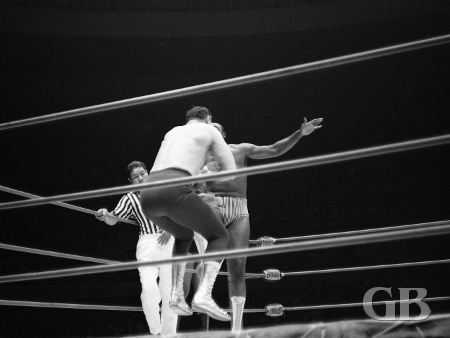 Johnny Barend leaps on top of a surprised Curtis Iaukea. Johnny Barend and Jim Hady win the Hawaiian Tag Team Championship belts.